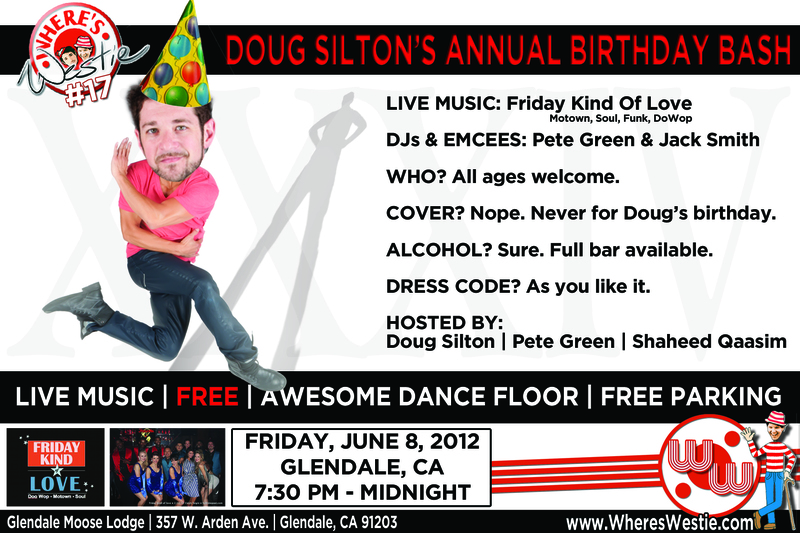 Welcome to Doug Silton’s Annual Birthday Bash / Where’s Westie #17! First of all – this is a FREE SOCIAL DANCE EXTRAVAGANZA. For this year’s event, we have Friday Kind of Love playing 3 sets for us. FKoL is a brilliant Motown, Soul, Funk, and Dowop band. Their BPMs have been tailored for swing dancers, ranging from 90 – 125 beats per minute. All ages are welcome. There is a full bar so you can drink to your heart’s content. The lodge has 2 parking lots plus plenty of free parking. Cover Charge? Nope. Never for Doug’s birthday. Dress Code? As you like it. Doug Silton, Pete Green, and Shaheed Qaasim. Special thanks to Jack Smith / OCWCSDC for providing our sound equipment.